Born in Kobe, Masaaki Suzuki began working as a church organist at the age of twelve. He studied the organ under Tsuguo Hirono at the Tokyo University of the Arts, going on to the Sweelinck Academy in Amsterdam in 1979. There he studied the harpsichord under Ton Koopman and the organ under Piet Kee, graduating with a soloist’s diploma in both instruments. His impressive discography on the BIS label has brought him many critical plaudits, and he is regularly invited to work with renowned period ensembles such as the Orchestra of the Age of Enlightenment and Philharmonia Baroque. Masaaki Suzuki also conducts modern orchestras, including the Leipzig Gewandhaus Orchestra, New York Philharmonic, Orchestre Symphonique de Montréal and Tokyo Philharmonic Orchestra, in repertoire as diverse as Britten, Fauré, Haydn, Mahler, Mendelssohn, Mozart and Stravinsky. 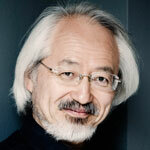 Masaaki Suzuki combines his conducting career with his work as an organist and harpsichordist. Founder of the early music department at the Tokyo University of the Arts, Masaaki Suzuki was named honorary professor there in 2015. He is currently guest professor at Kobe Shoin Women’s University as well as principal guest conductor at the Yale Schola Cantorum. In 2001 he was awarded the Cross of the Order of Merit of the Federal Republic of Germany, and in 2012 he received the Bach Medal, awarded by the city of Leipzig.